CHICAGO (AP) – Former U.S. House Speaker Dennis Hastert, awaiting sentencing in a hush-money case, had a stroke during the first week of November and has been hospitalized since then, his attorney said Thursday in a statement. 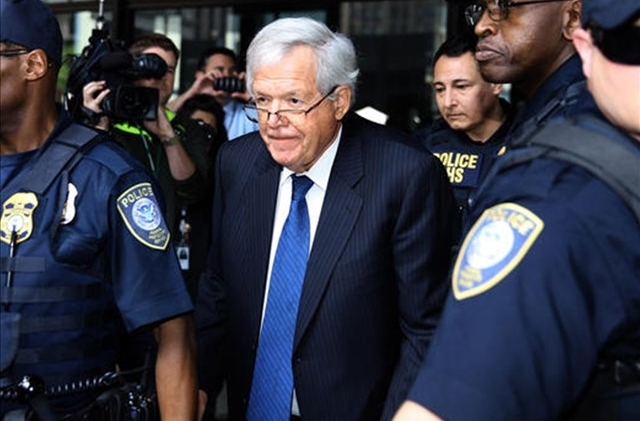 Attorney Tom Green said in a statement that Hastert had a stroke, has been treated for sepsis, which is a complication from an infection, and had two back surgeries while in the hospital. Hastert was accused in May of evading banking regulations as part of a plan to pay hush money to conceal his “prior misconduct.” Anonymous sources told The Associated Press and other media outlets that Hastert wanted to hide claims that he sexually molested someone decades earlier. The 73-year-old pleaded guilty Oct. 28 to a felony count of evading bank reporting laws in a hush-money scheme. In the written plea agreement, the Illinois Republican directly acknowledged for the first time that he sought to pay someone $3.5 million to hide misconduct by Hastert against that person dating back several decades – about the time the longtime GOP leader was a high school wrestling coach. The Illinois Republican’s sentencing date is Feb. 29. Prosecutors recommended that he serve no more than six months in prison. Hastert, who was speaker from 1999 to 2007, was a little-known Illinois lawmaker whose reputation for congeniality helped him ascend the ranks of Congress to become the longest-serving Republican speaker in U.S. history. In January 1999, House Republicans voted for him to succeed Newt Gingrich, who had lost support because of ethics violations and the party’s poor showing in the 1998 midterm election.